After trying several different seed mixes, this one is definitely the best. It encourages a wide variety of birds to my bird table. They eat every single seed so there's no mess or waste. Good value for money. 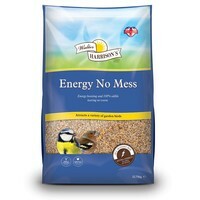 This is the best bird food that I have ever used and at the best price!!!!! I had another 'no mess' brand before this and I have found this one to be much less messy. I have spent ridiculous amounts of money with another bird food supplier buying 'no-mess' food .... until I discovered this! It's a much more affordable price and the birds seem to enjoy it just as much as the other stuff, so we're all happy. Some food is dropped from the feeders but I just wait until they've cleared that up before I fill up again.